So I have been doing some work on the meaning of place in defining the sacred and have considered how people claim space in religious venues. [You can take my survey here]. One of the more interesting entanglements of English legal history is how church pews became treated as a servitude to one’s real property. Of course, England was not alone in this regard. As Kelly Olds writes in her article Privatizing the Church: Disestablishment in Connecticut and Massachusetts, prior to disestablishment in America, pews were taxed. Afterwards, they were auctioned in order to raise money for the church’s work. It seems that entitlement to space in church has long been a problem. A pew still stands in Barking Church, Suffolk, bearing date 1601; another in St. Mary, Geddington, in the county of Northampton, dated 1602, and the building of pews went on increasing as we approach the civil war. The Cambridge critic quotes the following entry of [15/16] 1611 from the St. Margaret’s accounts. “Item: paid to Goodwyfe Wells for salt to destroy the fleas in the churchwardens pew 6d. ;” which not only shows, as he justly remarks, that pews were even then baized, but also proves that they were not an entire novelty at that time. A faculty, which in these cases either actually exists, or is supposed by the law to have existed, is the instrument by which some privilege is granted to a man by the favour and indulgence of ecclesiastical authority, and in the case of church seats is, generally, a license granted by the ordinary, or some officer to whom the bishop delegates his authority in such matters, to a certain person and his heirs, being owners and inhabitants of a certain dwelling-house, for him, and them, and their families, to sit, stand, and kneel, in a certain pew, in the church of the parish in which the house is situated, during divine service, exclusive of all other persons whatsoever. The form of the instrument may vary, but in substance it ought [27/28] always to annex a certain pew (whether already built, or about to be built, by virtue of the same faculty,) to a particular dwellinghouse; as the annexation of a pew to the person of the grantee, (or party to whom the faculty is granted,) though it has not unfrequently been attempted, is, in fact, invalid in law. These instruments are at present not often applied for, or granted; but when a faculty for appropriating a pew is required from the ordinary, notice must first be given in the church, calling upon the incumbent, churchwardens, and parishioners, to show cause why it should not be granted; and if no good cause is shown, in due time the faculty is issued…. A title by prescription is a title to property corporeal or incorporeal, (that is, to the realty or land, or to mere rights, as distinguished from the ownership of land, exercisable over, or by means of, the land of another, such as a right of way, or of common,) acquired by unobstructed usage and the lapse of time, and which, in the absence of any circumstances tending to repel the usual inference, the law supposes to have had a valid commencement. [Prescription is a term derived from the Roman law, and is nearly the same as usucapio. There were different periods recognized as making the title by usage respectively inchoate and complete; “longi vel longissimi temporis praescriptio;” which is accurately illustrated by the provisions of the Prescription Act, 2 & 3 Wm. IV. c. 71.] ….And thus when [30/31] long enjoyment, and the tacit acquiescence of all other interested parties, are proved, then, whatever the nature of the conveyance, grant, or transfer, which is necessary to pass the thing in question directly, may be, the law presumes that it once existed, and was, in fact, the commencement of the title in dispute. So, the interesting issue that I think this piece raises is the question of legal entitlements used to alter social expectations or to enforce social expectations. Have you ever sat in someone else’s preferred seating at church? If so, I’d love to hear about your experience. Please post comments below. In my next post, I will describe how we protect sacred space — both legally and non legally. For more information on American Disestablishment see Kelly Olds, Privatizing the Church: Disestablishment in Connecticut and Massachusetts, 102 Journal of Political Economy 277 (1994). 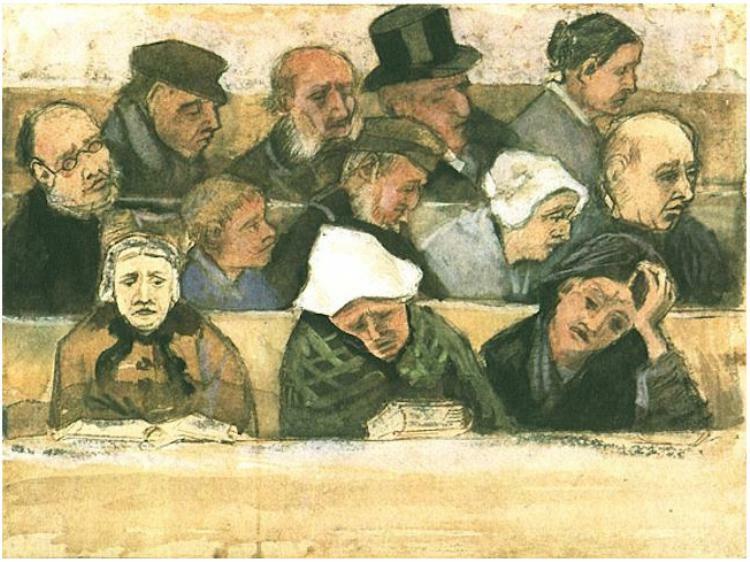 Image: Church Pew with Worshipers, Van Gogh (1882). Flannery O”Connor had a way of writing irony. 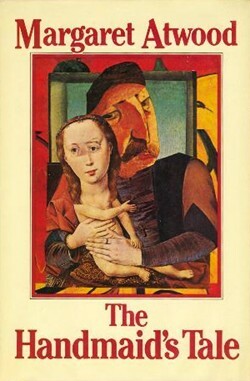 She, like other southern writers like Warren, Faulkner, and Clancy, understood that Southern relations are rarely only about authority or correctness — they are about ironic structure, which may raise issues of authority or correctness, but exists as a distinctive ptolemaic of the Southern mind. Irony — like the lonely companionship in Warren, or the role of poor authority in Faulkner. This tension of southern ironic structure is best exemplified in southern race relations — where class structure dictates ones capacity to speak. We have seen this tension in the past as well as our present. Consider the following clip posted by my friend Eric Fink. The shouts in the audience “go home,” the threat that any other outburst would result in an arrest…” all point to this ironic structure. Individuals are given a voice as long as they are a part of the structure. If they are not a part of the structure, then no matter how loud their voice may be, its unheard. And therefore has no capacity for challenging the structure. Thus, the structure is only challenged from within — an impenetrable quagmire asking citizens to place financial concerns below justice and rightness. This ironic structure shows up in O’connor’s short story The Barber. There, a college professor (probably in Georgia) finds himself embroiled in a dialogue over several visits about the impending Governor’s election. The discussion of the candidates is centered around race – one candidate is perceived by the audience to be a racial progressive, while one candidate is a status quo candidate. The story though, is threaded around two people who are entitled to debate the merits of the structure, and one person who is impacted by the structure, but has no voice (nor appears to want one). The Barber and his friends are foils that are responding sharply against the candidate that challenge the status quo. Clearly, the Barber and his companions represent the types of people that educated persons like O’Connor (and I presume most people that read this blog) struggle to engage. The Barber and his companion’s believe that the progressive candidate represents change. They ask the college professor “are you a Mother Hubbard?” — an allusion to one that seeks to change the status quo. [Old Mother Hubbard is a nursery rhyme believed to refer to King Henry VIII’s desire to divorce his wife Queen Katherine of Aragon so he could marry Anne Boleyn — a significant change in social and property relations if allowed. As the story goes, the King is the Dog, the Cupboard is the church, and the bone is the divorce. Thus, “Old Mother Hubbard, went to the Cupboard to get her poor doggie a bone. When she got there, the Cupboard was bare, and so the poor doggie had none.”] The Barber’s companions also refer to the progressive candidate as a “Boy Blue” another nursery rhyme reference, this time to someone that gloats or toots one’s own horn — [“Little Boy Blue, come blow your horn…”]. Thus, two sticking points in general for the literati — people that avoid change for change sake, and people that accuse those seeking change of merely boasting about their own worth or being braggarts. “Oh yes I have,” Jacobs snorted. Our fool, on his errand is disappointed and reverts to violence at the end, shoving the barber away — and foolishly runs out of the barber shop with his cape flapping and shaving cream dripping off of his face. “How’d you like to go to a white school, George?” the Barber shouted. The Barber and his companions treat George as a fools foil, asking George to validate their opinions and contradict the professor, and then satisfactorily sitting back as George does so. Ironically, so does the professor. But George understands the social dynamic better than anyone. He understands that disobedience means not having a job — from his perspective, going to a white school is not better than fetching white powders. He understands that going to white schools, while probably better, makes him no better off and likely results in greater violence to him. And George, understands that people like the professor, whether well-intentioned or not, have less at stake than he does. Which brings us back to the video of the protestors in North Carolina. These young people understand the stakes. They appreciate the risks. They engage the ironic structure with a voice that does not want to be heard . Kudos. Oh we can talk about the nature of reading and writing (which we do). We can hypothecate upon cultural dimensions of law that are reflected in literary traditions (which we do). We can work on their writing skills (which we do quite a bit). But, I can’t tell you that a single lawyer that has crossed the thresholds of my law and literature class ever was a better lawyer because of it. But what I can tell you is that making them better lawyers is not my primary goal. A few years ago, I interviewed with a law school in the South and during the interview one of the faculty members asked me “What would a night student in [insert Southern city] want with a course like Law and Lit-er-a-chure.” (Spelling intended to mimic the pronunciation). I was frankly taken aback and responded (and can remember my response word for word): “I don’t know. I mean I don’t know why a night student would want to take law and literature. But they should. Because law and literature challenges the basic presumptions upon which we build our daily existence by allowing our imaginations to freely function.” (That answer did not get me a job). So let me explain further. Law and Literature’s virtue is the rest of the legal curriculum’s down fall. As students memorize the rule against perpetuities, or try to decipher the battle of the forms in contracts, law school constricts their imaginary capacity — leaving them with the distinct belief that every problem has a distinctive legal solution. I shutter to say this but I worry that we actually create human beings who are less capable of engaging in human endeavors after a few years of law school than had we never gotten a hold of them in the first place. 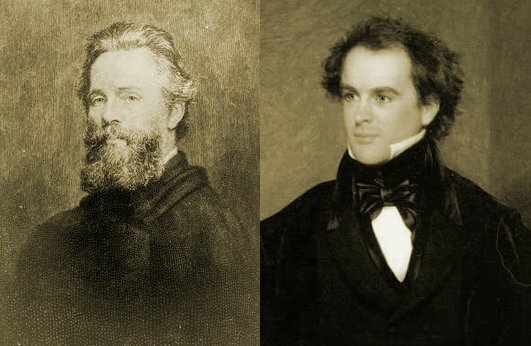 Law and Literature’s virtue then, is a reminder to our imaginary roots — to the return to literature about human relations, rather than literature that governs human relations. Law and literature teaches us to question the basic suppositions of life — that questions may be hard, and answers may be hard to come by. Law and literature teaches us that ambiguity is not such a bad thing, and that every problem does not deserve an answer, but rather deserves simply time — like time turning the pages of a book, or time writing prose that seems plain and mystical at the same time. That would be my answer today to the question — night students need Law and Literature because their imaginations have stopped, and they need time to allow them to grow. (And I am still certain this answer would definitely not get me a job).